I enjoy reading your blog. 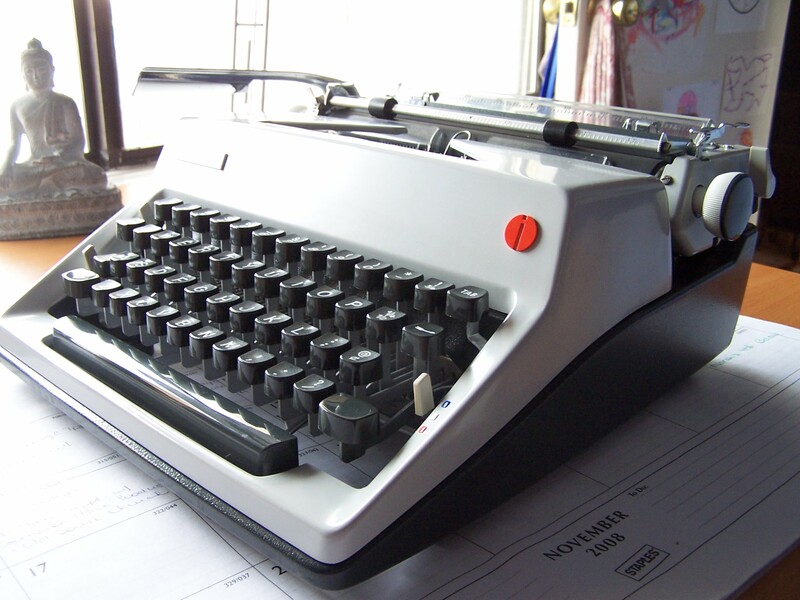 I’ve dabbled in typecasting occasionally on my blog, but usually compose in fountain pen, or manual typewriter, and type into Word after redline editing (literally) the 1st draft. Anyhoo, I’ve been dabbling in photography since the late 1970s, using anything from Minox to 8×10, all older, used equipment or, more recently, a plethora of handmade pinhole cameras of various formats. See the website http://www.f295.com for more pinhole madness. I, just this week, acquired a Panasonic Lumix G1 digital camera. My first new camera since — get this — 1979!! It’s a marvel of new technology, a true “bridge” camera between point-&-shoot and full-featured DSLR. I would recommend looking into one of these if you plan on exploring electronic image capture. A great ergonomic, compact camera with excellent image quality and features that make it compatible with older manual focus lenses, with the (soon to be introduced) adapter rings. Keep up the good typecasting! Thanks – I will check it out. I’m definitely curious about moving beyond just a point ‘n shoot digital. I’m just worried about long term image storage, given that digital storage media seem to become obsolete in a handful of years. I mean, I still have negatives I shot in high school that I can make excellent prints from to this day! If you don’t mind my asking, what did the tune-up set you back? Did you need a new platten? I have a few typewriters of different vintages in different conditions. One happens to be a nearly identical SM-9. Same year but with the 13″ carriage. I’m wondering what I should set aside to keep it in tip top shape. The tune-up cost me $75. He didn’t need to replace the platen, but he lightly sanded it down to remove any unevenness on the surface. I was told that most platens can be saved this way, and rarely need replacing. I always use two sheets of paper at a time when I type, just in case. Yeah, the SM9’s have a nice, precise snap to their action that I rather like. I have a couple of sm-9’s and and sm-7. By far the late models are my favorite to write on.